Resources for fourteen gatherings on topics such as forgiveness, loss, nature, money, and friendship. 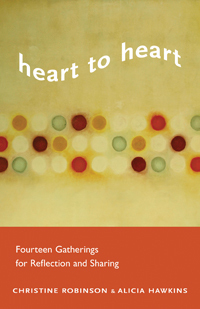 A reimagined model of small group ministry, Heart to Heart offers readings, journaling suggestions, and thought-provoking exercises to help participants prepare for the spiritual practice of sharing in community. Promotes listening rather than back-and-forth discussion. Find a bonus Small Group Ministry session plan entitled Rest and Relaxation on our Skinner House Companion Resources page. Exhausted from the chores of caring for an ailing family member, a woman dragged herself to her women’s group one evening. She had not had time to do the reading, and she wondered if she would have the energy to listen to others share. But she was in charge of refreshments, so she went. As the group gathered, she felt herself beginning to relax. Checking in felt like taking the invisible burdens off her shoulders and putting them down on the floor. She stumbled through her sharing, feeling incoherent and emotional. “This thing with my parents has been hard,” she said, “but it’s also been real. I’m not quite ready to say I’m glad it happened, but there have been some good things for my family and for me.” One woman in the group especially related to her sharing and remembered her own similar experiences and learning. Their eyes met in that moment, and they both understood that they were not alone. Although they had said no direct words to each other all evening, they had received strength and wisdom from each other. Two wild, shy hearts had met and been encouraged. Something like that happened to us, and we thought it was important enough to design a structure where it would happen more often in groups created for sharing and growth. We realized that most people are unpracticed at deep sharing and supportive listening. We also realized that support groups and discussion groups often don’t fulfill their potential of being safe places for deep sharing. Some people dominate; others feel they can’t get a word in. Some people don’t think well off the top of their head, and others chatter away but can’t figure out how to share what is in their hearts. And while lots of people would like to be in these kinds of groups, it’s hard to find someone willing to be a leader. We wanted to design a process that would make it easier to form sharing groups and more likely that they would work well. We wanted participants to share deeply and listen with open hearts to the wisdom of others, and we wanted the leader to have the same rich experience that participants did. I only wish I could convey adequately the delight that the people in our first four groups have expressed on hearing that there are new sessions! It has been a special privilege for me to witness the profound impact of the program as our members awaken to the potential of listening as a spiritual discipline.Each group has left the first session feeling a sense of deep kinship with their new group members and arrived at realizations that although the particulars of our stories are different, there are many universal experiences; that each of us has faced some sort of struggle and emerged knowing our own resilience; and that we are all striving to make sense of things and to be better people.